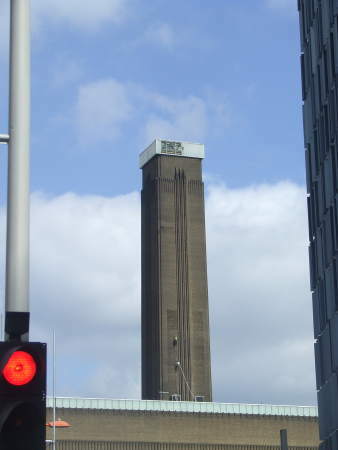 Surely the headline Tate Modern chimney damaged in storm is inaccurate. 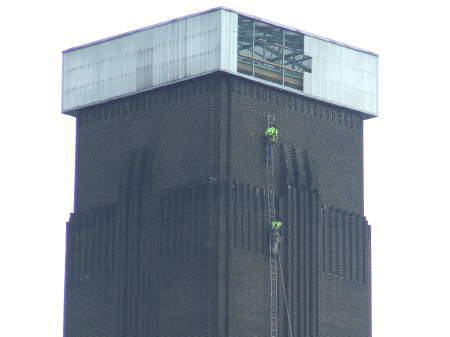 Giles Gilbert Scott's sturdily constructed brick chimney is unharmed. It is only Herzog and De Meuron/Michael Craig Martin's lightweight perspex "Swiss Light" on the top that was damaged in the gales. IMHO, this poorly proportioned lid has done it job to announce the conversion of the power station. How much money would we have to give back to the Swiss Government to get rid of this blot on the SE1 skyline for good? I seem to recall that the chimney was only capped in this way because the original plan to install lifts to a viewing platform couldn't be afforded from the Millennium funding pot. Given the visitor numbers they are already battling with, my suspicion is that some Tate curators breathed a sigh of relief, given the experienced of the Pompidou Centre, which IIRC became the most visited attraction in Paris, but where thousands of vistitors come through the doors just to ride the escalators for the views without looking at any of the art inside. You're quite right; the headline was misleading. I've edited it. And fixed a typo too. 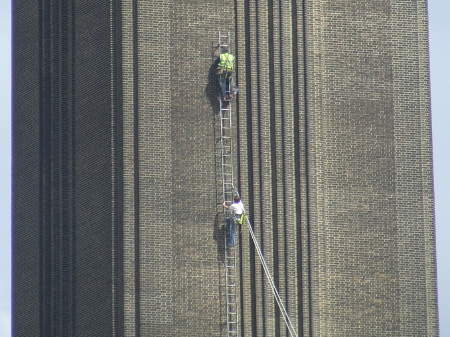 It looks like the Swiss Light might finally be repaired; a very long ladder is currently being installed on the southern face of the chimney. These pictures are from yesterday - the ladder is even higher up now, but hasn't reached the top yet. Maybe it's cynical o'clock chez Reece, but I suspect that the lightbox would have been fixed long ago if it had been facing any direction other than south. They're not going to fix it, silly. The ladder reaching to heaven is another of the "happenings" they've been doing this week. Go, little guys! Go! You can make it! Great news! I have visual confirmation - the little guys have made it to top!